South Asia in World History. Writing a broad historical synthesis of a region extremely varied as South Asia from ancient to present times is no easy task. It is even more difficult to compile such history in a concise book while situating it in a global framework, as the New Oxford World History series aims to do. All these difficulties notwithstanding, Marc Jason Gilbert’s volume is a highly readable, lively and well-structured introduction to the history of South Asia, particularly worth reading for an audience with little previous knowledge of this field. Gilbert’s book enfolds in eight chapters, which follow a chronological pattern, and which partially reflect the periodization that is hegemonic (though not unproblematic) in Indian history today. The first three chapters deal with ancient India from around 4,000 BCE to 711 CE. While explaining the high level of cultural, social, religious and political sophistication that characterized the subcontinent in different timespans during the period under analysis, Gilbert effectively shows how ancient history is not immune from the risk of “how the needs and desires of the present may impinge on an understanding of the past” (p. 11). Hindu nationalist arguments attempting to project the current characteristics of Hinduism back to the Harappan civilization or the question of the Brahui language as supporting the theory of the Aryan invasion, popular among the anti-Brahman Dravidian movement, are instances of the politicization of early history that Gilbert does not neglect. These chapters also bring attention to trade connections and philosophical exchanges not only within South Asia, but also with other world regions like the Persian Gulf and Mesopotamia, the Roman Empire, and China. Chapters four and five, covering the period from 711 to 1757, describe the arrival of Islam in India, the establishment, evolution and decline of the Delhi Sultanate and the Mughal empire, and the penetration of India by European merchants before the battle of Plassey, which marked the beginning of the territorial control of the British East India Company over the subcontinent. Moreover, these chapters render an account of the flourishing agriculture and commodity production as well as the expanding networks of trade that contributed to the circulation of goods and ideas in the region and beyond. Marc Jason Gilbert manages to explain the “Hindu-Muslim encounter” (p. 66) in the subcontinent by showing the influence of Hindu and Muslim devotional practices over the more institutionalized forms of religious belief. It does not come as a surprise that both chapters, overall covering only forty pages, are very dense. This is in part compensated by Gilbert’s use of anecdotes and illustrative quotations which – as in the rest of the volume – contributes to keeping the reader engaged with the narration. Nevertheless, both chapters are not without their flaws. For instance, in chapter four, due to a typo, the first battle of Panipat between Babur and Ibrahim Lodi (1526) appears to have happened in 1556 (p. 63), namely the year of the second battle of Panipat that saw the decisive victory of Akbar over Samrat Hemu Chandra Vikramaditya, something which can be confusing for the inexpert student. Also, in chapter five, the introductory reader may find it difficult to follow the thread of European penetration of the region and to grasp the fundamental differences that existed between their colonial systems. In the same chapter, the way Mughal emperor Aurangzeb is presented does not take into account recent scholarship that provides a more nuanced image of the Mughal emperor than that of a staunch Muslim driven by the will to impose Islam and curb Hinduism. Chapter six illustrates the Company Raj and the transition to Crown Rule. Whereas Gilbert successfully examines the political action and ideology of the colonizers, both accounts of the predatory exploitation of Bengal resources by the East India Company after Robert Clive’s victory as well as of forms of anti-colonial resistance other than the Great Mutiny are conspicuous by their absence. Nonetheless, chapters seven and eight are maybe the most problematic ones. Chapter seven deals with the period from 1877, when Queen Victoria was proclaimed Empress of India, to the attainment of independence for India and Pakistan in 1947. The fact that several crucial issues like the creation of separate electorates, the formation of the Muslim League, the emergence of the Hindutva ideology, the role of Nehru and Ambedkar in the anti-colonial movement are hardly mentioned, suggests that this chapter could have been expanded and divided into two chapters to allow the reader a deeper understanding of phenomena that had a lasting effect over the region. A similar argument can be made for chapter eight, which covers the period from 1947 to the present. Besides at times relying on dated literature – as for the case of the Sino-Indian war of 1962 – this chapter provides a very sketchy account of the other countries of the South Asian region that have almost not figured at all in the rest of the book. However, this last part is not unnecessary, as it can be useful to give the reader a sense of the common experiences in terms of political, economic, cultural and social changes across the several states of South Asia. In sum then, South Asia in World History presents a few shortcomings. Some of these, such as simplifications of complex phenomena and processes, can be explained by the very nature of a slim textbook. Others, such as putting the main focus on India to the detriment of other regional countries – a choice which becomes visible as soon as one looks at the book’s contents – are more problematic. The bias towards India, despite being justified by the country’s dominant position in the region, could have been addressed in the introduction by providing the reader with a clear explanation of this choice. Other flaws, like typos and incorrect dates, are quite surprising for a book published by the prestigious Oxford University Press. Compared to several existing introductions to South Asian history, Gilbert’s volume breaks away from the more conventional spatial paradigms. Nevertheless, in doing so, important themes like India’s central role in long-term global trade connections, migration flows within and beyond the region, the transnational perspective on anticolonial nationalism are only quickly surveyed through anecdotes and examples scattered across the text. Also, South Asia in World History would have greatly benefitted from a more thorough engagement with recent scholarship on the interactions and exchanges between South Asia and the wider world. This, altogether, often makes it difficult for the book to meet the expectations raised by its title. 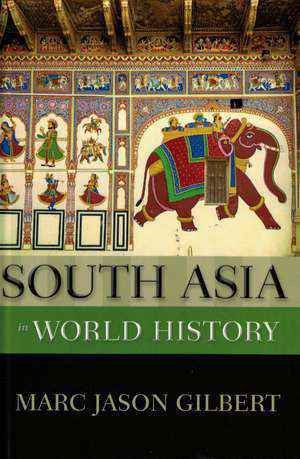 These shortcomings aside, it needs to be emphasized that, measured against the paucity of space, this book can be considered an accessible and suitable introduction to South Asian history for undergraduate students and for a more general audience with an interest in the role of India in the region and the role of the region in a larger global context. The themes dealt with by Marc Jason Gilbert, like the accommodation of different religious traditions, the global integration of commerce, the rise and decline of empires, imperialism, freedom movements and decolonization, are significant not only for India and South Asian societies, but also for broader processes in the history of the world. Readers will enjoy the lively narration, the anecdotes and well-chosen quotations as well as the illustrations, photographs and maps that enrich the book. Elena Valdameri: Rezension zu: Jason Gilbert, Marc: South Asia in World History. Oxford 2017 , in: H-Soz-Kult, 28.08.2018, <www.hsozkult.de/publicationreview/id/rezbuecher-28360>.